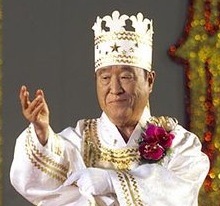 Sun Myung Moon is considered the Messiah, the "Lord of the Second Advent," the "Third Adam." His Divine Principle is regarded as the "Completed Testament." Moon and his wife are True Parents of humanity, and he has come to leave the spiritual work that Jesus could not complete during his time on earth. The movement has a strong mediumistic streak, and various entities (including Jesus, founders of assorted world religions, political figures, and Moon’s deceased son, Heung Jin Nim) are said to have given messages to confirm Moon’s message and messiahship. The movement does not provide a complete list of the countries in which it has significant operations or membership.